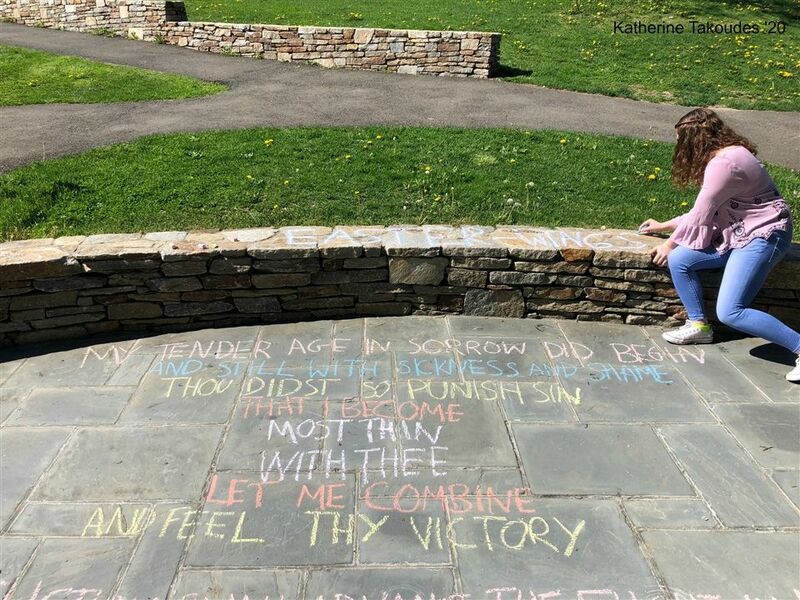 Sophomore Casey Goldberg ’20 chalks “Easter-Wings” by George Herbert outside of the Kneisel Squash Center. As a tribute to National Poetry Month this past April, English 10 students have brought poems from inside the classroom to pathways on The Hill. Although only sophomores were writing out the chalk poems, these students and their teachers hope that the words impacted the greater Hopkins community. Casey Goldberg ’20, a student in Johnson’s class, said, “The goal was that at least one person would stop to see our poems and think about something else other than a difficult math test for a few moments.” Ridky and Johnson highlighted that with the school year coming to a close, it can be a stressful time for both students and faculty: “We all spend a lot of time up in our heads, thinking about what we have to do next. It’s like, next, next, next. Sidewalk poetry forces people out of the headspace that the school day forces them into,” said Johnson. Other students noticed the poems around campus. Ellen Ren ’19 said, “It’s something I wouldn’t expect around campus and I like to stop and read the inspirational words.” Henry Fisher ’20, a student in Ridky’s class, added, “I liked seeing people stop to read my poem because I felt like I was personally informing them.” Julia An ’21 noted the hard work that the sophomores put into the poems: “The chalk poems are nice if you’re just walking to your next class, but then you see a bit of chalk at your feet. By paying a bit more attention to them, you see that they grow into this poem that students willingly wrote and spent time on,” An said.